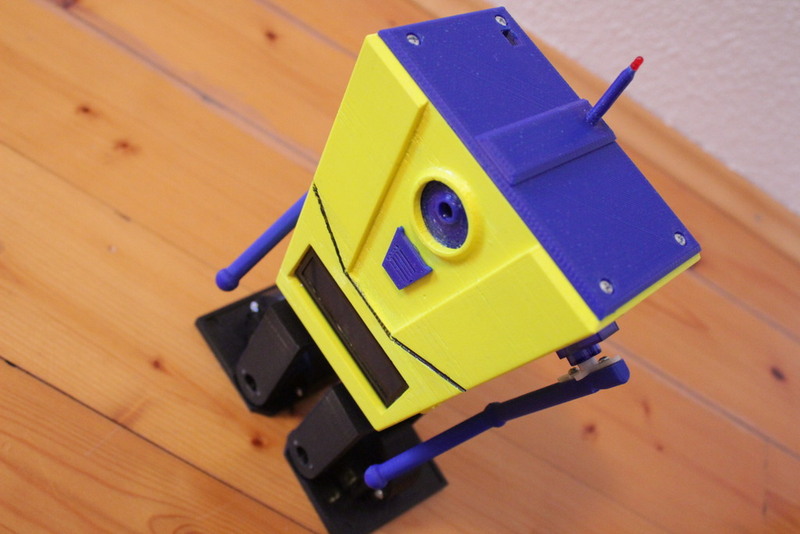 CH1P-E Claptrap Robot by Thomas Mayr « Adafruit Industries – Makers, hackers, artists, designers and engineers! This Chip-E is remixed with CL4P-TP aka Claptrap from the video game Borderlands. This gives Chip-E an even more robotic look. Besides that we have added arms to enable better dancing abilities. With his new eye ( Pi-Cam) he can see and snap pictures. Speaking of it we have added a Raspberry Pi Zero, with this major hardware upgrade the possibilities are almost endless. So e.g. we changed the little piezo speaker to a real speaker, which we connected over a lowpass filter to the GPIO Pin 18 of the Pi according to adafruits instructions: “https://learn.adafruit.com/adding-basic-audio-ouput-to-raspberry-pi-zero”. So now the ChipE is capable to talk in a real Language or to play songs.